Edited by Stephen King and Bev Vincent. Includes Signed Bookplate by Bev Vincent! Fasten your seatbelts for an anthology of turbulent tales curated by Stephen King and Bev Vincent. This exciting new collection, perfect for airport or airplane reading, includes an original introduction and story notes for each story by Stephen King, and brand new stories from Stephen King and Joe Hill. Welcome to Flight or Fright, an anthology about all the things that can go horribly wrong when you're suspended six miles in the air, hurtling through space at more than 500 mph and sealed up in a metal tube (like—gulp!—a coffin) with hundreds of strangers. All the ways your trip into the friendly skies can turn into a nightmare, including some we'll bet you've never thought of before... but now you will the next time you walk down the jetway and place your fate in the hands of a total stranger. 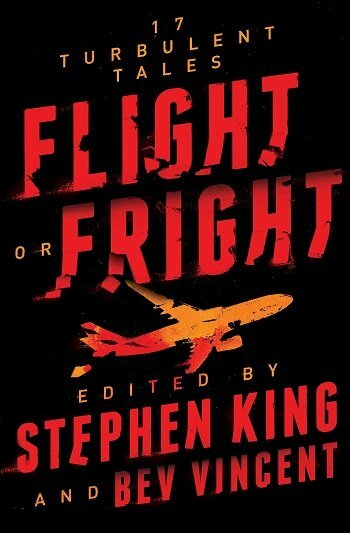 Featuring brand new stories by Joe Hill and Stephen King, as well as fourteen classic tales and one poem from the likes of Richard Matheson, Ray Bradbury, Roald Dahl, Dan Simmons, and many others, Flight or Fright is, as King says, "ideal airplane reading, especially on stormy descents... Even if you are safe on the ground, you might want to buckle up nice and tight." Well, we were sitting around at dinner before a screening of The Dark Tower in Bangor, and there were a lot of people who’d flown in for the big night. I mentioned that I hated flying, and the conversation turned to various airplane stories, some scary and some funny. I said there had never been a collection of flight-based horror stories, although I could think of several (including the Matheson and the Conan Doyle, which are in the book) about the terrors of flight. I said someone ought to do the book. Rich Chizmar said, "I would, in a heartbeat." It took more than one heartbeat, but Flight or Fright is now a book. Bev Vincent, that incredible polymath, agreed to team with me as co-editor, and now the book—including several new stories, one by me and one by my son, Joe Hill—is an actual fact. Bev and I think it would make ideal airplane reading, especially on stormy descents. I was sitting next to Rich Chizmar in a Bangor restaurant when Steve came up to us with this idea for an anthology of horror stories involving flying. The fact that we were across the street from Bangor International Airport was especially apropos. Steve and I dug deep to come up with this collection of stories—some of them I'd read before but many of them I hadn't. It was a delight to find tales by some of my favorite authors that fit the loose theme and also to be introduced to several new-to-me writers who had published some chilling tales. Then there's the new stories by Steve and Joe Hill, both of which are terrific and disturbing contributions to this sub-genre. I spent 24 hours total on two flights to and from Japan while working on this project and I spent a lot of time...a LOT of time...thinking about all the things that might go wrong when I was 35,000 feet up hurtling through space at 500 mph in a torpedo with wings. Is it a little twisted that we hope this anthology makes a lot of other people equally nervous the next time they board a flight? 2019 Scribners Publications trade paperback. New / New. Sealed. This product will be in stock on 06/04/2019.